The photos were taken by one of the people who contributed to saving the bridge, Lincoln McCardle. Like many residents in London, Lincoln has close ties and memories of the bridge, as he hung out with friends and the like at the bridge while growing up. His mother, Judi, has even more of an attachment to the bridge to a point where she has had a house located in the “visual vicinity” of the bridge (and judging by the article, her house does have a great view with the bridge.) She has even painted pictures of the bridge and has collected some works on it!!! 1. The bowstring arch bridge had been closed to all traffic from 2013 until the project. What factors led to the decision to restore the bridge? The decision to restore was actually very much in doubt for some time. While deemed the more expensive in the Environmental Study Report, it was decided that rehabilitation was the preferred option. I believe that key factors that went into this decision were: importance as a significant heritage structure, role within the parks and pathway system as well as transportation network and perhaps most importantly it’s value to the community. In short, people love it! 2. Who were the key players in the project to restore the bridge? Most notably the city of London itself. As well as provincial and federal government funding. Much of the prlimanry work was done by Dillon Consulting and the actual construction and rehabilitation work was done by McLean Taylor Construction Limited. Of course, there were many community and heritage activists whom without this project may never have taken place. 3. Describe in phases how the bridge was restored, beginning with the dissembly and ending with the reopening? Remove non-structural items to reduce weight lifted. cranes set up for worker access. Lift bridge off the abutments and lower it down to an area above the river for improved worker access, while continuing to support it from the cranes at all times. Cut bridge at the mid-span with torches while supported by the cranes. Lift each half of the bridge to the nearest side of the river. Dismantle and inventory the bridge for delivery off site for rehabilitation. After nine months of the off-site repair and rehabilitation, the bridge was returned back in place across the Thames River on August 15, 2018. 4. Where was all the work done? The bridge was actually transported to St. Mary’s, Ontario where the work was done. (About a 45 minute drive away from the site.) it was decided that bridge removal and off-site rehabilitation provides benefits including a longer life expectancy and improved worker and public safety. Off-site rehabilitation within a large indoor space created a safer worksite, ensure better quality control, reduce the need for environmental protection measures and take advantage of the winter months to complete much of the work. It also allowed for hot riveting to mimic the workmanship of 1875. 5. Why was the bowstring cut into half before being flown? Why not use the truck or two helicopters at the same time for carrying the bridge? Two large cranes were required simply to lift the bridge – including one that is amongst the largest in North America. The bridge itself is 216 feet (65.8 meters) and is the longest working span of that kind in North America – it was determined that cutting it in half was the only possible way to transport it. 6. What difficulties did you have in restoring the bridge? The rehabilitation process involved an ongoing assessment of the condition of the individual bridge parts with a combination of reuse, upgrades and the fabrication of replicas. Much of the wrought-iron members were in good enough condition to reuse. For example, the pedestrian railing and lattice that exists in several locations on the bridge were reused with local upgrades where corrosion is severe and bridge design requirements dictate. The bowstring arch was also reused and upgraded where its condition required. 7. Some historians and bridge preservation claimed that restoring the bridge is not considered restoration but more like a replacement because of new materials that were used to replace the old plus some of the extra components added to the bridge which compromises the historical value of the bridge. What is your opinion on that? I reluctantly see their point. While I’m confident that every effort was made to restore as much of the original structure as possible there were clearly beyond repair and severely corroded. These needed to be replaced with new similar looking parts to increase the longevity of the bridge. While all original parts would have been ideal and had simply been neglected to long and at this point I’m happy to have the original bridge back – or at least a as much as possible the 1875 design of it. 8. Was the bridge listed on any Canadian national registry prior to restoration? Did it maintain its status when it was reopened in November? Yes and yes. Blackfriars Bridge is a heritage-designated property under Part IV of the Ontario Heritage Act on April 21, 1992 and is included on the Ontario Heritage Bridge List, a list of provincially significant bridge structures. In 2016, Blackfriars Bridge was recognized as a National Historic Civil Engineering Site by the Canadian Society for Civil Engineering. In addition, it is included on the Canadian Register of Historic Places. 9. Up until this interview, has this bridge received any accolades or at least a nomination for its restoration? Yes, in fact I’m attending a gala tonight as it was nominated for an ACO London 2019 London Heritage Award. (https://acolondon.ca/news/2019/1/28/announcing-the-2019-london-heritage-award-nominees) As well, it has been nominated as one of the Great Places in Canada many times over the years. (http://greatplacesincanada.ca/) Perhaps most telling however is the number of times it has figured in various artistic works, visual and literary. The bridge is loved and cherished by many. 10. The Paper Mill Bridge in Delaware has won the Ammann Awards in two categories: Bridge of the Year and Best Example of a Restored Historic Bridge, narrowing beating you in a voting marathon. In both categories you got second place, meaning a silver medal. In addition, you guys won the Author’s Choice Awards for Best Example of a Restored Historic Bridge. Congratulations on both! What is the reaction have you guys been receiving? It’s been really special to have a bridge that means so much to me appreciated by others. The truth is my personal goal was simply to raise awareness of the bridge – so to have it even nominated was far beyond my initial expectations. And to then win the Author’s Choice Awards for Best Example of a Restored Historic Bridge is a dream come true. It really is a local heritage gem and to have it recognized outside of our corner of the world really validates what I’ve felt all along – we are blessed to have such a historic span. The bridge has supported Londoners for 145 years and its well-deserved that it gets some support in return! 11. We have some examples of bowstring arch bridges that have been sitting abandoned and waiting for restoration and repurposing. Among them include a bowstring arch bridge in Flensburg, Indiana, Livermore Falls Bridge in New Hampshire and the Kern Bowstring Arch Bridge in Mankato, Minnesota, the latter still holds the title of being the longest historic bridge in the US and second longest in the world behind you. What advice would you give to the groups interested in restoring the structure and bring it back to life for recreational purposes? It sounds cliché but team work makes the dream work. I honestly believe that this restoration would have taken place without a lot of people reminding their friends and neighbours that not only did this bridge exist but that it was special and deserved to be saved. The lower cost of simply replacing it with a new structure was tempting to local government but heritage is a non-renewable resource. Given the obstacles faced by this project, I would suggest that the best time to start such a campaign is 25-years ago, with today being the next best option. Many thanks to Lincoln for the interview and the photos. Blackfriars Street in London, Ontario reopened to traffic after five-year closure and one year extensive restoration work. LONDON, ONTARIO (CANADA)- At 225 feet (68.6 meters), it is the longest bowstring arch bridge in the world. It was one of the longest ever built by the Wrought Iron Bridge Company in Canton, Ohio At 143 years of age, it is one of the oldest historic bridges of its kind left in Canada and North America. It is one of the rarest bridges to find in the country because of its dwindling numbers. And now, after five years including one year of a complete restoration, the Blackfriars Street Bridge in London, Ontario is back in business. Thousands convened to the bridge on December 1st to commemorate the reopening of this unique bowstring arch bridge, located at Blackfriars Street, spanning the North Branch of the Thames River connecting Blackfriars Park on the west bank and Harris Park on the east bank. This included a ribbon-cutting ceremony followed by a parade of cars that crossed the newly restored structure. The cost for the complete restoration was $8.6 million, which was split between local and federal funding. 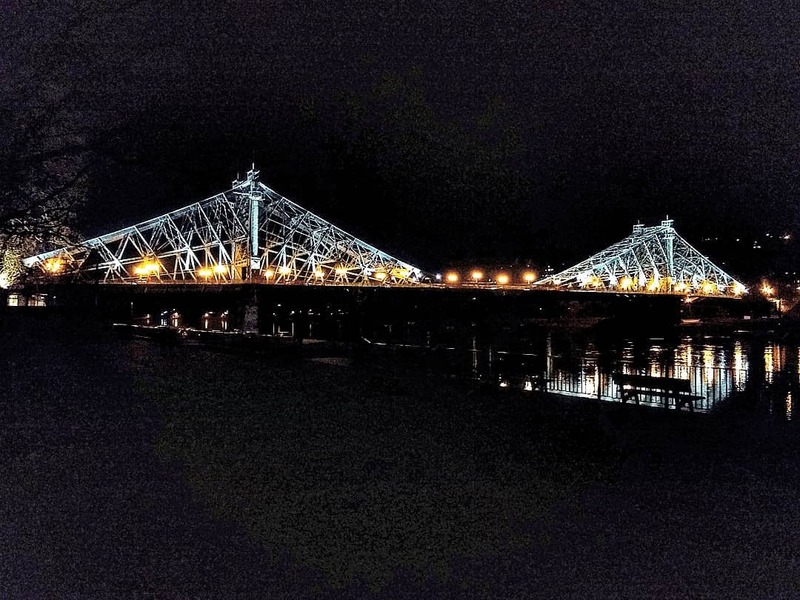 For many residents and bridge enthusiasts, it is a relief to have the structure back in service while at the same time, retain its historic and cultural integrity. Many have had great childhood memories of the bridge and were happy to see the bridge open to traffic. From its build date of 1875 until its closure in 2013, the bridge served vehicular traffic before structural deterioration forced its restriction of the bridge to solely pedestrian cyclists in 2013. In November 2017, the bridge was lifted off its place, cut in half, then dismantled to be transported to an offsite complex where it was sandblasted and welded, with several parts being replaced. While his claim is that with the complete replacement of bridge parts with new materials is as bad a bridge replacement, one needs to look at the difference between the Blackfriar’s Street Bridge before and the structure after the replacement to see the difference. It is clear that the portal bracings and the upper chord are different; the portals veered away from its three-tiered Lattice and X-frame portal bracings with heel bracings and was replaced with simply the X-frame with heels, whereas the original beams with Phoenix columns have been replaced with rectangular beams, much of the vertical and diagonal beams appear to be the same. One needs to have a look at the bridge for himself to see the difference. Nevertheless, inspite of the criticism, the restoration of the bridge and its reopening of the crossing will provide drivers, cyclists and pedestrians alike with an opportunity to gain access to the university complex on the western bank of the Thames from the greenery area on the east side, where the two branches form the Thames. But most importantly, the City of London got back their beloved historic bridge, one of only a handful of historic landmarks left for the city, but one of the most important that a person should see when passing through. This is one that is not only in the running for this year’s Ammann Award in the category of Best Example of a Restored Historic Bridge, but one on the places to visit list for many, like myself, who have yet to see the structure and judge for himself how much alteration was actually done. The Blackfriars Street Bridge has its own Twitter website, where you can follow up on the bridge and read the stories behind the structure and the love affair the people have with the longest bowstring arch bridge in the world. Click here and follow for details. Our 28th Pic of the Week takes us back to 2007 and this bridge in Minnesota- the Kern Bridge. 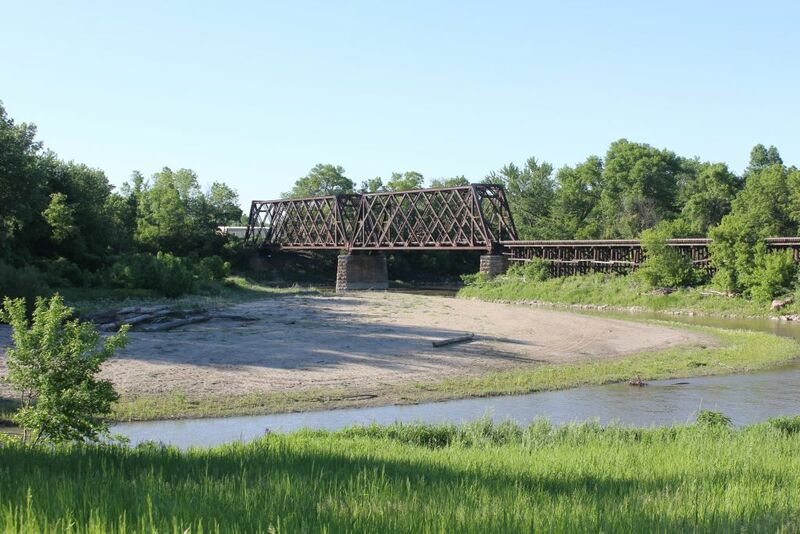 Located south of Mankato, this 1873 product of Wrought Iron Bridge Company is the longest bowstring arch bridge in the US, with a span of 190 feet. It is the second longest in the world behind the Blackfriar’s Bridge in London, Ontario (Canada). The bridge has been closed since 1990 and has been sitting abandoned ever since. Unless something can be done to rehabilitate the bridge, the structure is on the verge of collapse with a cracked abutment and missing planks according to the latest visit by James Baughn. Currently, there is some collaboration behind the bridge’s future in terms of restoring it for reuse. Yet lack of funding and the will to restore it is still imminent We’re looking for some ideas as to what to do with this structure. Does anybody have any ideas? 143 year old Gilliece Bridge collapses after truck five-times its size tried crossing. Charges expected. The future of the bridge is questionable, given the damage to the structure. The curved upper chords are bent but can be straightened out, whereas the vertical and diagonal beams are either bent or broken in many places. Already hit by numerous tractors who had crossed it in the past, the upper bracings will need to be replaced, which will partially compromise the historical integrity of the bridge. Yet more details on the extant of the damage to the bridge will come as Julie Bowers of Workin Bridges, based in Grinnell, as well as other bridge restoration experts will examine the extent of the damage and determine its salvagibility of the bridge. The Gilliece Bridge, which is also known as the Murtha or Daley, was constructed in 1874 by the Wrought Iron Bridge Company of Canton, Ohio. It was one of over two dozen bridges that were built by the company in the 1870s and 80s, thanks to efforts of bridge agent George Winthrop, who worked with the county to secure deals for bridges to benefit landowners living in the hilly areas along the Upper Iowa and Turkey Rivers. The bridge was 151 feet long with a main span of 129 feet. It was rehabilitated in the 1990s which included reinforcing the stone piers with concrete ones, one of which the truck trailer was sitting on when the bridge collapsed. It was considered historically significant in surveys conducted by the late James Hippen and the State of Iowa and was subsequentially listed on the National Register of Historic Places in 1998. Workin Bridges bought the structure with the intent to relocate it in the near future, allowing for the county to work on replacing it with a modern bridge. which is to respect the lives and property of others. This incident is another example of the disrespect to both, no matter how a person interprets it. The Bridgehunter’s Chronicles will keep you posted on the latest regarding the Gillecie Bridge and the events that follow the incident. A couple months ago, I posted a Mystery Bridge article about one of the bridges in Harrison County, Iowa, based on a tip provided to me by a local familiar with the bridge. This bridge is located at Pontiac Lane, just off 220nd Street, two miles east of Hwy. 30 in Logan. As mentioned in the article, the bridge was unusual because of its length over a small creek, and it was a through truss bridge, according to the online maps. There were many questions about this structure, including its aesthetic appearance, age, and the date of when it was replaced by a culvert but left in place. There was a sense of hope that someone might take a look at the structure and provide some pics for it, to help solve the case. This is where Adrian Brisee comes in. From observation, the bridge is a single lane through truss bridge of Whipple type, with pinned connections. The diagonal and vertical beams are connected with a loop. The portal bracings are a three-layer set, where the top and bottom layers are Howe Lattice (with the bottom having heel bracings) and the middle has an X-shape. This puts the date of construction back to between 1870 and 1885, when these portals were used. It also narrowed down to the number of bridge builders who used it, including Wrought Iron Bridge, King and even some of the companies in Ohio and Pennsylvania, many of whom were consolidated into American Bridge Company in 1900. The portals were subsequentially phased out in favor of those with letters, like the A-frame, X-frame, etc. Additional markings however suggest that this was a Wrought Iron Bridge product, namely the star-engravings at each of the bottom latteral chord, as shown in the picture. This is typical of all WIBCo as 70% of their bridges have this, including the Freeport Bridge in Decorah and the Hungry Hollow Bridge near Mankato (now extant). Judging by the length of the bridge, it is between 130 and 180 feet long; the width between 15 and 17 feet. When was the bridge built? Was this bridge originally built at this location or was it relocated from elsewhere and if so, where? Was there a previous structure before this bridge? This is in addition to the ones left to be answered. The questions are important for the condition of the bridge has deteriorated over the years, with the western side dropping three feet, thus bending the entrance noticeably. With its nomination to the National Register, funding would be made available on the state and federal levels to restore the structure and convert the area to a park. Given its unique history involving historic bridges, including some imported from out of state, Harrison County would profit greatly from having some sort of historic bridge park or district with tour guide with a list of historic bridges to visit, just like in Madison County. But before we can nominate this bridge, we have some questions to clear up, which can only be done by hopping into the car, driving to the bridge for some pics and lastly, visiting the library, museum and highway department, for starters. Having international recognition in the category of Mystery Bridge (a fifth place finish) is a start. The next ones are all yours to take. If you haven’t read the results of the Ammann Awards or the Author’s Choice, please click here to take a look to see if your bridge received one of the two or both. Going back to the series on Ulm and New Ulm with sister column The Flensburg Files, we will take a look at the bridges in the American counterpart. Located along the Minnesota River at the junction of the Big Cottonwood River, New Ulm, with a population of 13,400, has some of the characteristics of Main Street USA. Yet as you pass through, everything you see is German, from names to buildings and monuments, as well as the market square and the Oktoberfest. New Ulm is served by two key highways: Minnesota Hwy. 15 between St. Cloud and Iowa going north to south, and US Hwy. 14 between Mankato and Rochester in the east and Walnut Grove and Brookings to the west. The railroad line owned by Canadian Pacific runs parallel to this highway. These highways and railroad had once made New Ulm a key trading center when it was established in 1854 and rebuilt after the Dakota War of 1862. With that came the crossings along the Minnesota and Cottonwood Rivers, which helped serve this purpose. Today, the highways are modernized and with that, longer and wider bridges to serve traffic- at least for the east-west route as New Ulm and Mankato are located only 15 miles from each other, making commuting easier. 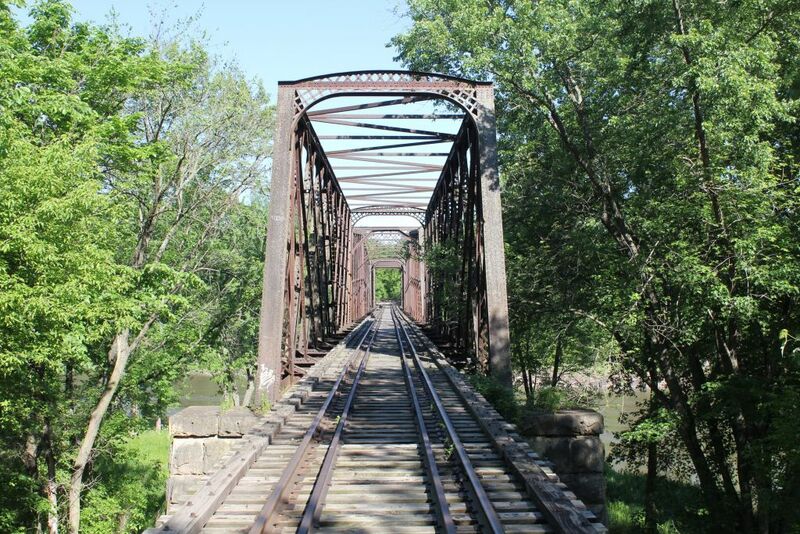 Yet many traces of history can also be found mainly to the south of New Ulm, where historic bridges once stood but today only a pair of vintage railroad bridges are still standing. This guide takes you through the city of New Ulm and the historic bridges that had once existed but have been replaced. The purpose is to remind visitors of their existence and the bridge companies that were responsible for turning New Ulm into a city of commerce, a title still held as proudly today as its German heritage. Most of the bridges profiled are located to the south and east, with a pair of outlyers to the north. You can find them on this map, when clicking here. The stone arch bridge spans 6th Street North, carrying the Canadian Pacific Railroad. The 38 foot long stone arch bridge was constructed in 1909 and had originally served both the east-west route (owned by CP) and a north-south route which was once owned by the Minneapolis and St. Louis Railroad. That line connected New Ulm with Winthrop (in the north) and Storm Lake, Iowa (in the south) until its abandonment in 1970. The bridge now only serves the CP route, but it serves as a key entrance to German Park, located just to the west of this bridge in the northern part of the business district. 12th Street Overpass in New Ulm. Photo taken by John Marvig in September 2011, shortly afterwards it was replaced. 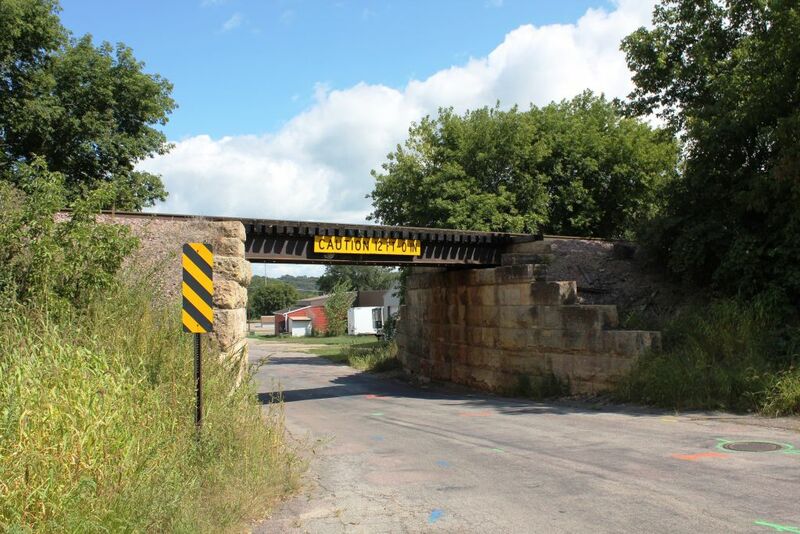 This bridge is located at the far end of New Ulm, spanning 12th Street North, carrying CP Railroad. Built in 1911, the 30-foot bridge featured a plate girder decorated with wooden railties. However, due to structural concerns, the bridge was replaced with a combination steel and concrete structure in 2012. It still serves traffic today. Located over the Minnesota River opposite the city center, the Redstone Bridge is the longest of the bridges in New Ulm and one of the longest of the railroad bridges spanning the Minnesota River. The 880 foot long bridge, consisting of two quadrangular truss spans with Town Lattice portal bracings and a 207-foot long swing span built of Pratt design and featuring a beam-style with heels portals, was built in 1880 by the Leighton Bridge and Iron Works Company in New York. 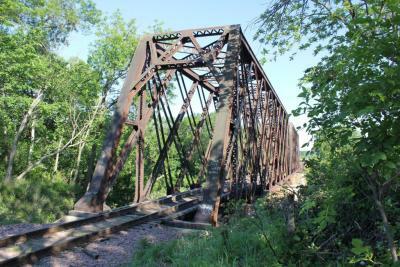 It originally served the main line of Chicago and Northwestern Railroad, connecting New Ulm and St. Peter. However, the line was detoured in 1971 to have it connected with Mankato, thus rendering the line to St. Peter useless. The bridge still serves rail traffic but only to the quarry near the Courtland Cutoff before it terminates. The piers of the swing span was reinforced with concrete in 2014 to stabilize the structure, but overall, the bridge is still in use and maintains its historic significance. It is listed on the National Register of Historic Places. Located only a half mile northwest of Redstone Bridge, the Cottonwood River crossing is the longest bridge over the Cottonwood River (and the last crossing before its confluence with the Minnesota River only 600 feet to the east) at 733 feet total. The bridge features two quadrangular truss main spans with A-frame portal braces, each measured at 157 feet, with the rest being wooden trestle approach spans. These were replaced with concrete and steel trestle spans in 2009. The bridge was built in 1913, using the piers of the 1890 span, which had deteriorated to a point where replacement was necessary. The bridge continues to serve rail traffic to Mankato today, for it is the main line served by Canadian Pacific Railroad. Located just west of MN Hwy. 15 on Cottonwood Street, Poor Farm Bridge represented a lone example of a bridge built by the Security Bridge Company based in Billings, Montana. The structure was built in 1907 and featured a pin-connected Pratt through truss with Howe lattice portal bracings with heel bracings, with a total measurement of 155 feet. The bridge continued to serve traffic until a cracked eyebar in the bottom chord led to its closure in February 1991. It was replaced with its present structure 3 years later. Had the advancement of historic bridge preservation been as predominant as it is right now, chances would have been likely that this bridge would have been standing, serving light traffic or at least be used as a pedestrian crossing. But the lack of technology pertaining to fixing broken iron and steel beams contributed to its demise. 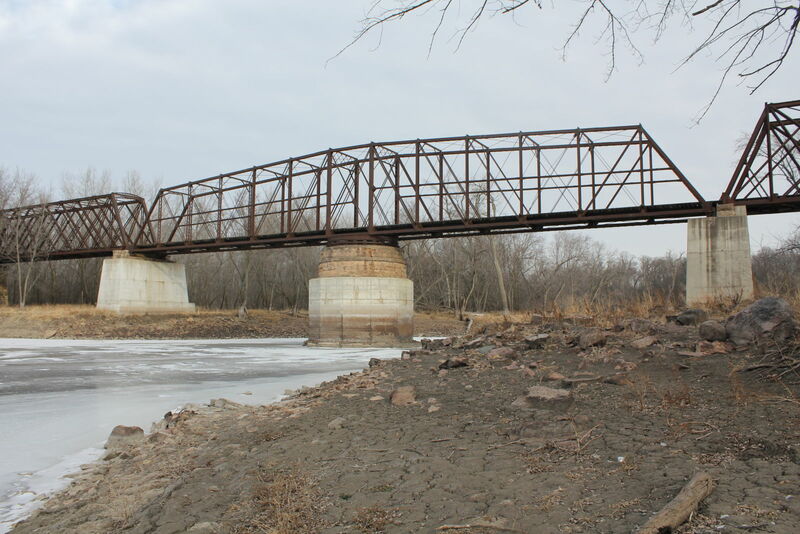 Located over the Minnesota River 300 feet north of the present 20th Street Bridge, the Courtland Cutoff Bridge featured two Pratt through truss spans with Town lattice portal bracings supported by 45° heels. The bridge’s end posts and vertical posts were both V-laced, and it appeared to be built of iron. Although there are no records as to who built the 1892 bridge, the portal bracings and the builders plaques are typical of that built by Massilion Bridge Company in Ohio. But more information is needed to confirm this argument. The 335-foot bridge served traffic until 1978, when the present bridge was built on a new alignment. By 1980, the bridge was moved to the history books with the parts being reused for other purposes. Today, like the truss bridge, the Courtland Cutoff serves as a shortcut to Mankato without having to drive through down town New Ulm. Spanning the Cottonwood River east of the present Hwy. 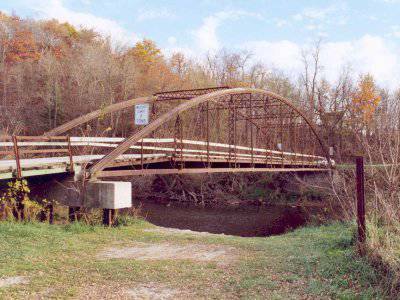 15 crossing, the Metzen Bridge was built in 1880 and named after a nearby farm that had existed since the establishment of New Ulm in 1854. The bridge was built in 1880 and represents an example of a typical Wrought Iron Bridge Company bridge with its ornamental Town Lattice portal bracings and builder’s plaques. The 441-foot bridge featured a pin-connected Whipple through truss span (148 feet) and steel approach spans. Until 1932, the bridge was the primary crossing for Hwy. 15 going south of New Ulm. After a new crossing was built on a new alignment 700 feet to the west, the ownership of the Metzen Bridge was switched over to the city, which owned it until its removal in 1981. 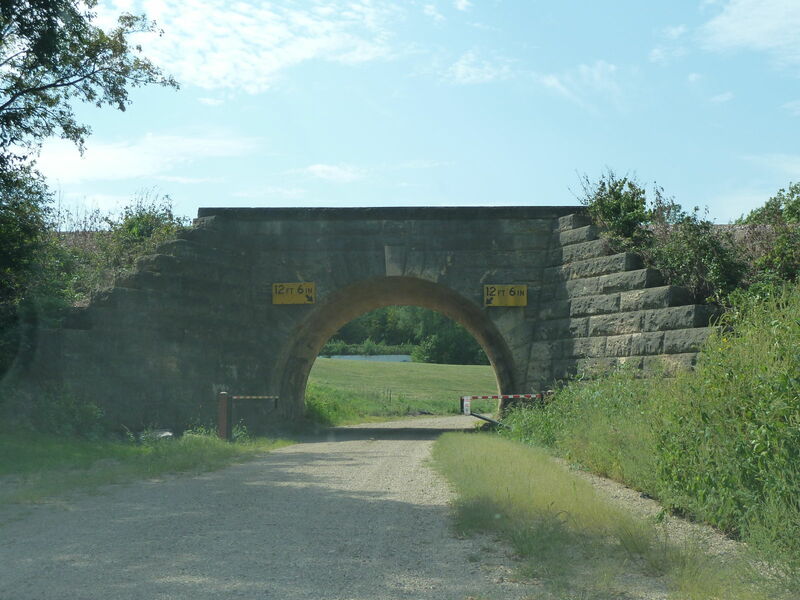 The bridge originally was located where Shag Road makes a sharp right going north and east towards the Cottonwood River Railroad Bridge. It originally was called Bridge Street because of the bridge. Yet Bridge Street terminates nears the Jensen Motors site, 250 feet north of the bridge. Had the bridge been standing, it would have been listed on the National Register because of its rare truss design. Ideally, it would have an excellent crossing for a bike trail leaving New Ulm going either south or along the Cottonwood. Built in 1932 replacing the Metzen Bridge, the Broadway Avenue Bridge featured a continuous deck truss design using a combination Howe and Pratt designs. The connections were riveted. At 66o feet, the bridge was the second longest along the Cottonwood River. It was built on a new alignment alongside the Milwaukee Viaduct, a steel viaduct built in 1899 that had served the New Ulm-Madelia-Fairmont line until 1971. The purpose was to eliminate the dangerous curves presented by the Metzen Bridge, making the straightened road safer for travellers entering and leaving New Ulm. This was kept in mind in 1983, when the bridge was replaced with its present structure. Together with the Minnesota River Crossing at Hwys. 14 and 15, the Flandrau Bridge represented a classic example of a multiple span steel truss bridge built by the Illinois Steel Bridge Company. This bridge was built in 1921 and featured a two-span Camelback truss bridge with A-frame portal bracing and riveted connections. It provided travellers with a direct access to Flandrau State Park from the south until its replacement in 1962. Together with the Flandrau State Park Bridge, this bridge was built by the Illinois Steel Company in 1922. It featured a Parker through truss main span with two Warren pony truss approach spans (all with riveted connections), totalling a span of 350 feet. The A-frame portal bracings were replaced with Howe lattice portal bracings in 1939 to accomodate the increasing height of trucks crossing the Minnesota River going in and out of New Ulm. In 1963, as part of the plan to widen the highway to four lanes, the bridge was replaced with its present structure. Today, the crossing still serves Hwy. 14 between New Ulm and Mankato as well as Hwy. 15 between New Ulm and St. Cloud, providing New Ulm with commerce from the north and east. This article is part of a series on the cities of New Ulm, Minnesota and Ulm/ Neu Ulm, Germany, produced together with sister column, The Flensburg Files. To access the articles in the series, please click on the symbols for access…. Many thanks to Pete Wilson from Minnesota Department of Transportation for his help in finding some information and photos on the bridges, as well as John Marvig for allowing the author to use some of his photos.